This is one of the most classic arrangements that will easily fit into any kitchen interior. The chairs can be either made of solid wood or feature soft velvet or leather cushions. In addition, there are dozens of shades to choose from, including very light and very dark ones. Another popular option, suitable for modern kitchens, is glossy MDF. 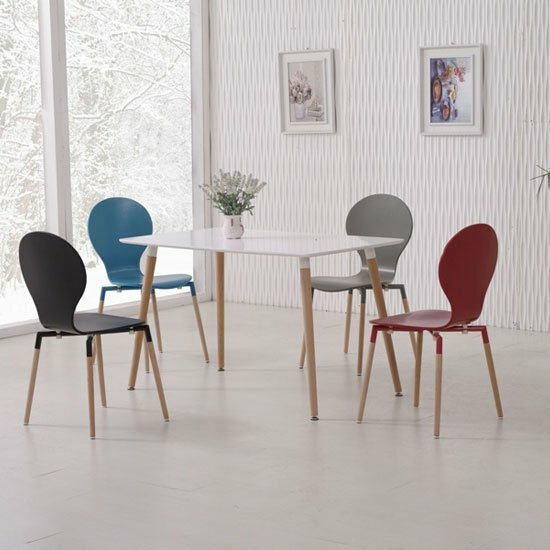 Similar to wooden sets, chairs can be either firm or soft. 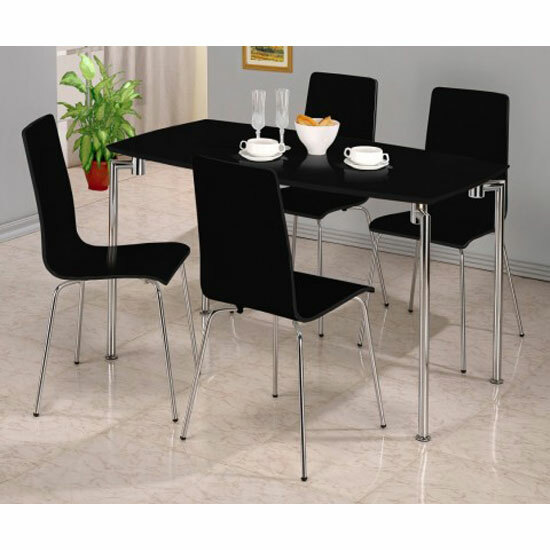 In addition, a lot of kitchen chairs in sets like these can feature chrome or stainless steel legs, which look very bright and stylish in combination with high gloss. This one of the most exquisite options, which is not very common for kitchen interiors. That is a pity, since tempered glass is not only an incredibly durable material – it is also very easy to maintain. Unlike wood or MDF, the surface is impenetrable to liquids, grease stains, or any other outside influence. Plus, it is easy to clean, which is also a nice bonus for the kitchen. Another popular option is rustic kitchen tables and chairs. Normally made of reclaimed wood, these sets feature interesting design and incredibly solid build. Alternatively, chairs can be substituted with a bench or a couple of benches – depending on your space and the number of seats you need. Wooden kitchen tables and leather chairs are more suitable for spacious kitchens, designed in traditional style. Quite often, sets like this will also feature corner sofas instead of chairs, which is another stylish and cozy decoration idea. Vintage wooden furniture can be another great idea for spacious kitchens. However, you should make sure that your home interior matches the picture you are trying to create – after all, antique looking interiors are usually very demanding and require a lot of matching furniture items and accessories. Final word of advice is to stick to big retail chains any time you are shopping for furniture, kitchen tables and chairs included. First of all, finding all the items you need in one place is easier any time you are choosing them in a big store. Next, the prices are usually a bit lower, so if you are looking for the best deals, big chains are a better way to go. In the UK, Furniture in Fashion is one of the best examples of a store that can offer its customers a chance to look for furniture online, check it out personally in a showroom in Farnworth, and get an urgent delivery to any corner of the country.